The council of the Latvian Trade Union of Education and Science Employees (LIZDA) today decided to organize an indefinite strike in September if teachers’ pay rules are not amended by mid-May, informed LETA/BNS. The Estonian School of Diplomacy has won a public procurement organized by the Government Office of Finland, according to which approximately 100 Finnish top officials must be trained before the start of the Finnish presidency of the Council of the European Union beginning on July 1, informed LETA/BNS. he city government of the Estonian city Tartu and the European Investment Bank (EIB) signed a 20 mln euro framework loan agreement that will support the city's investments into education, informed LETA/BNS. On the last week of March, at a solemn ceremony in the headquarters of Rietumu Bank, winners of the composition competition among Latvian pupils were announced. Riga French Lycée (founded at the request of the government of France), Riga Zolitudes Gymnasium (founded only 33 years ago, but already has received many awards), Bauska Secondary School, Daugavpils Secondary School No. 9 and other Latvian schools successfully participated in this project. The council of the Latvian Trade Union of Education and Science Employees (LIZDA) today decided to launch the procedure of strike because it has not feel confident that the government this year will follow the agreed timetable on raising teachers’ wages, reported LETA. Last week, at a solemn ceremony in the headquarters of Rietumu Bank, winners of the composition competition among Latvian pupils were announced. The 28.4 million euro Delta center, the new joint study and research institute of the Faculty of Economics, the Institute of Computer Science and the Institute of Mathematics and Statistics of the University of Tartu, has reached its full height, reported LETA/BNS. The government today failed to reassure the Latvian Trade Union of Education and Science Employees (LIZDA) that money would be provided for raising teachers’ wages as promised this year, so the teachers will go ahead with their picket on Wednesday, informed LETA/BNS. The Latvian Trade Union of Education and Science Employees (LIZDA) has sent the European Commission a letter, claiming violations of national education laws in Latvia’s 2019 budget, reported LETA. 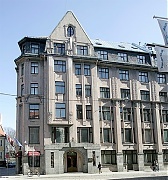 At least 15 educational institutions will be reorganized this year, while five schools will be liquidated, although the total number may be even higher as some local governments, including Riga, have not yet finalized their school network optimization plans, according to the Education and Science Ministry's data informed LETA.